You can restore the nice and attractive appearance of the your darkened, stained, covered with moss and algae patio using our professional help. Our cleaning technicians can apply effective and complete removal of all contaminants, moss, weeds and lichens. We use advanced rotary jet washing machines that need only water and access to drainage to remove stubborn grime and pollutants. The process is effective and done by professionally trained and practised cleaners. They can offer you impeccable patio cleaning for your domestic and business property, based in London, done at an affordable price. Our cleaning technicians can make your patios and pathways rid of the grime and soiling that make them unsightly and dangerous. We offer regular and once done pressure washing of house and business property outdoor areas. Use our services to try them out and see for yourself the results. We can promise you that you will have perfectly washed and impeccable patios that will increase the price of your property. 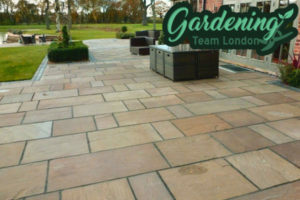 Our patio cleaning services are at your disposal in London seven days in the week. Instead of using buckets with water, cleaning solution and various tools to wash your paved and natural stone recreation areas you can call us and leave this work to the professionals. Our cleaners use powerful and effective jet washer which are the most effective machines to provide sanitising of dirty patios. 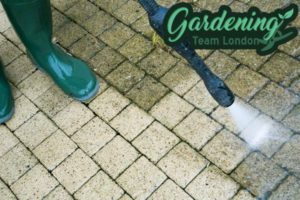 You can rely on them to perform high-quality patio cleaning in London for your home or commercial estate which will have great results. We have affordable rates and flexible working hours to meet the needs of each customer.